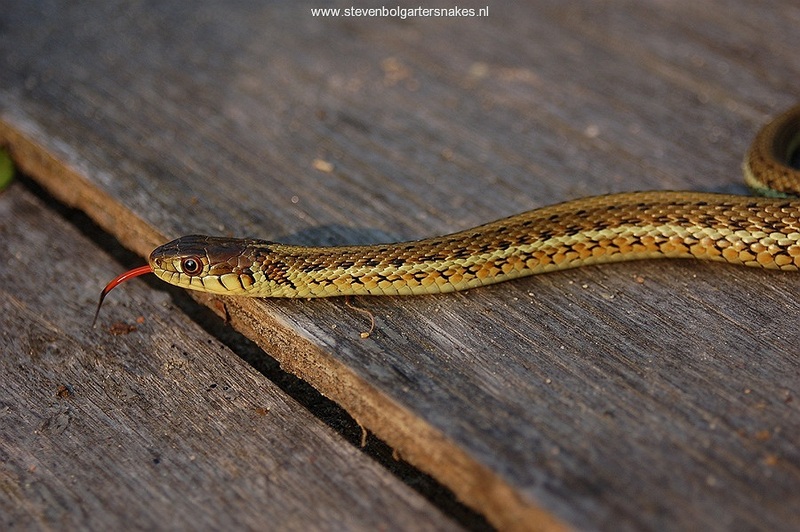 Thamnophis eques scotti, a subspecies of the Mexican Gartersnake, is still quite rare in most private garter snake collections. 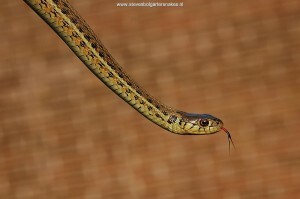 But of all the subspecies of Thamnophis eques probably the most common one. This subspecies occurs only occurs in Lao de Magdalena, Mexico. Thamnophis eques scotti was described by Conant (2003). 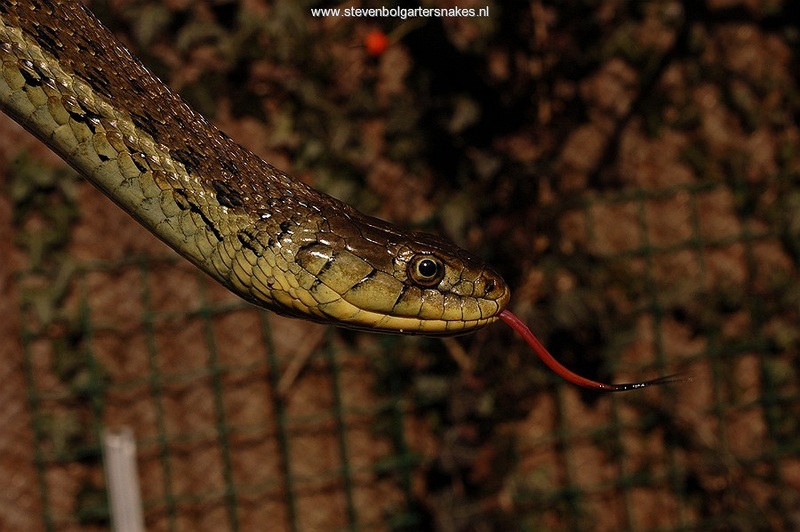 T.eques is a very large and heavily built gartersnake and Conant (2003) had set the new record for T.eques (obscurus) at 121,6 cm total length. Personally I had the privilege to observed a Thamnophis eques scotti of 130,7 cm total length, a new record (Bol & Bruchmann, 2012). I would not be surprised if also this new record will be broken in captivity soon. Especially female Thamnophis eques can grow very large and heavy. 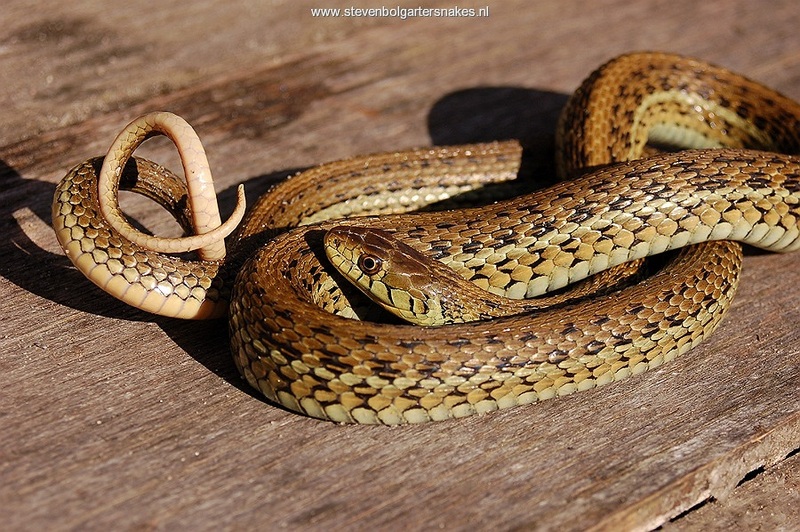 In fact adult female T.eques are the largest gartersnakes I have ever seen. 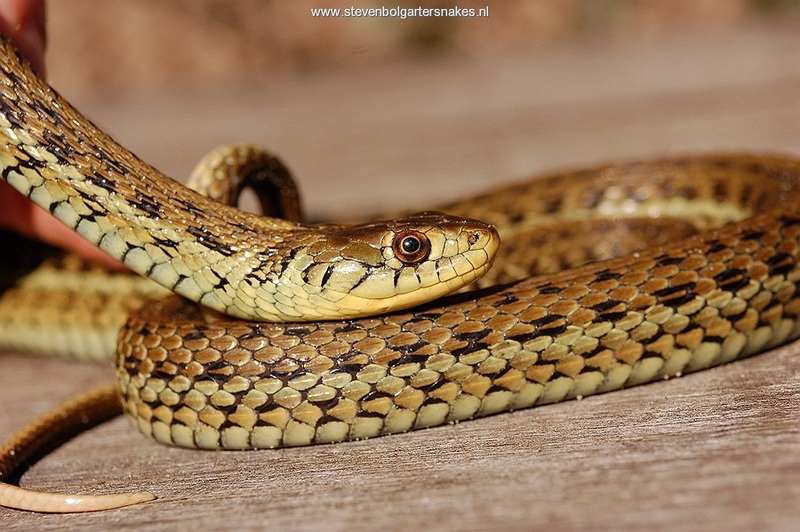 The only garter snake that really grows to much larger size is Thamnophis gigas from California. The snakes are light colored (yellow, light brown, pale green) and typical is their unusually wide middorsal stripe which can cover up to 7 scale rows. 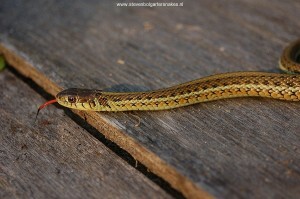 Conant (2003) called these snakes blonde in coloration. 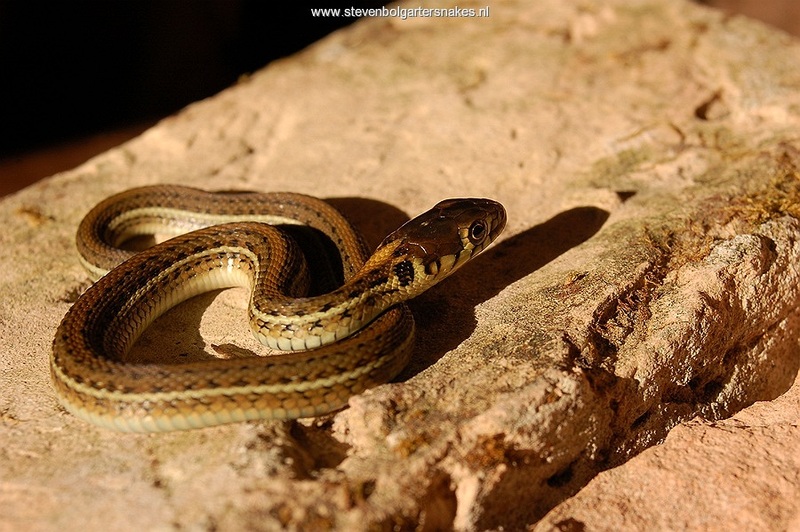 The yellowish or brownish-yellow middorsal stripe can have the same color as the remainder of the body so that it sometimes looks like the snakes lack the dorsal stripe. But in most specimens the middorsal stripe is well defined. The lateral stripes are more prominent (whitish yellow) and can almost be bluish green. There are usually 2 rows of black spots between the rows which can vary in size and may be more or less conspicuous. Conant (2003) mentions the huge variability within this population as typical for this subspecies. This variability is also visible within the litters. Some snakes are heavily blotched, others are very uniform in appearance. Some have a reddish brown head. Breeding specifically some of these color variations will likely reveal very nice color and pattern combinations in the near future. 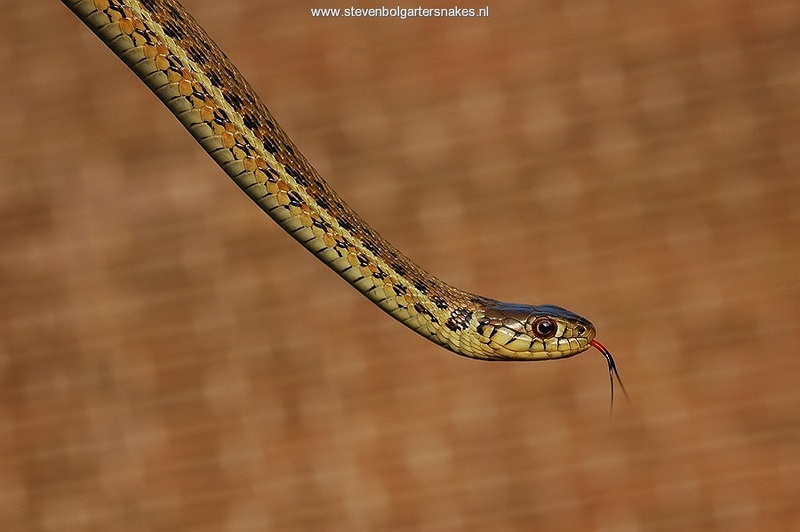 Scott’s Mexican Gartersnake does very well in captivity. The snakes show themselves a lot basking on a branch under the lamp. Especially when the terrarium is not so warm and the snakes need to bask on the hottest spot to reach their optimal body temperatures. 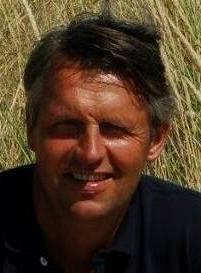 A hibernation will not be absolutely necessary although it is expected that they will have a resting period in nature when they are less active. Due to its large size it is recommended to keep them in a terrarium with a minimum size (for one adult couple) of 100 x 50 x 50 cm, although a length of 150 cm would be more suitable. They do well in a dry and well ventilated cage with just a water bowl for swimming and drinking. The water bowl should be big enough for them to submerge in. Local temperatures in the terrarium should rise to 30 – 35 °C. T.e.scotti are voracious feeders and relatively easy to keep. A cool period in the terrarium of 2 – 3 months will probably be sufficient to keep the snakes in good health and to stimulate breeding. Up to now I hardly give the snakes a hibernation. But the snakes are clearly less active in the coldest winter months; they bask less and often refuse to eat for several months. So do not worry when this happens. 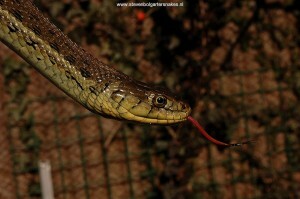 During the winter months night temperatures in my snake room (and in the terrariums) drop at night to 8 – 12 °C. I keep my adult snakes in a completely dry terrarium with a water bowl. This species is also very suitable for a so-called “aqua-terrarium” with a lots of water and only a small (completely dry!) land part which is heated by a powerful lamp to 30 – 35 °C. A second clutch often follows in October or November. (zie Bol & Bruchmann, 2012). 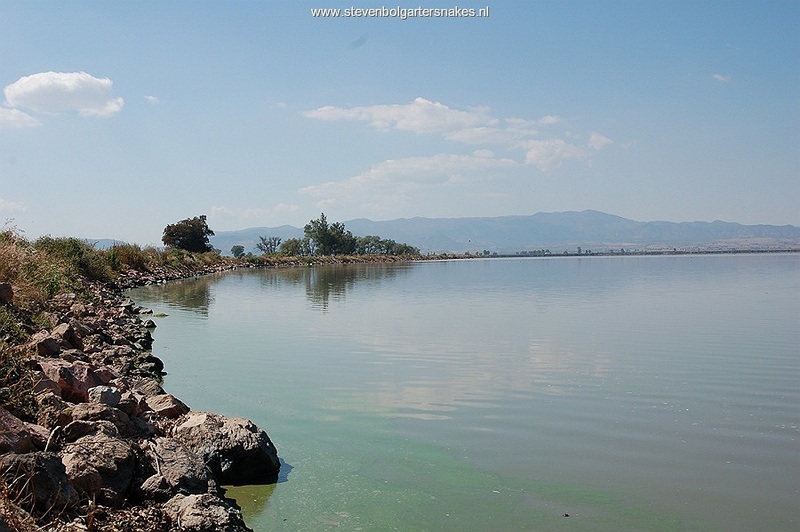 Scott’s Mexican Garter Snake is found in the lake of Magdalena. This endorheic lake is situated in the Mexican state Jalisco at 1380 meters above sea level. The current lake is only small compared to what it used to be long ago. I have observed this subspecies several times in Mexico (Bol & Bruchmann, 2012). The snakes can be found predominantly right along the water’s edge and in the lake. 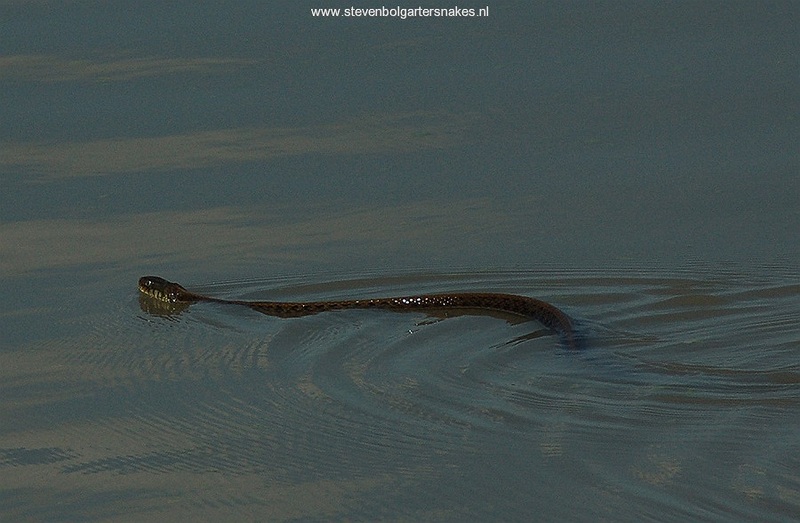 It is a magnificent sight to see these large Garter Snakes swimming and floating in the water. 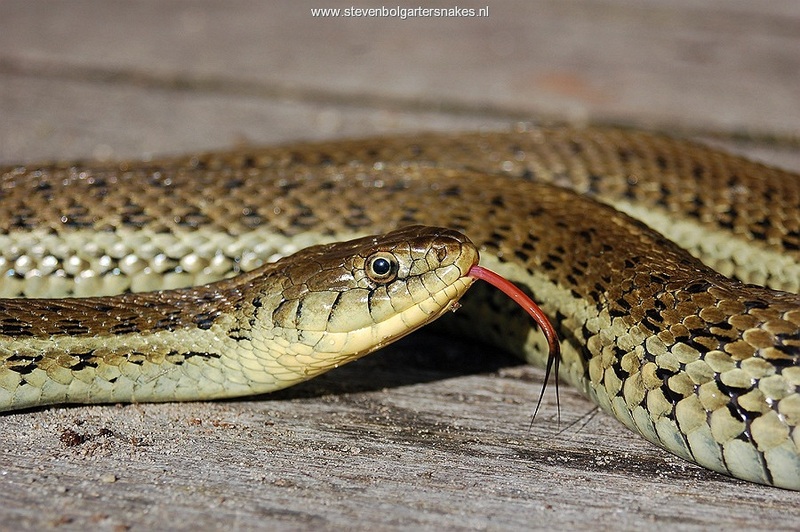 My recent article about Thamnophis eques scotti (Bol & Bruchmann, 2012) that can be found online in english on this website can serve as a standard recommendation (care sheet) for this subspecies of the Mexican Garter Snake. My breeding group consist of (offspring of 4) unrelated wild caught specimens. This gives the possibility to breed juveniles that are totally unrelated. Perfect for future breeding programs. I am breeding this subspecies since 2007.